I have no idea where I found this recipe! When I printed it out the link didn't show up at the bottom of the page so now I have no clue despite trying to search again. 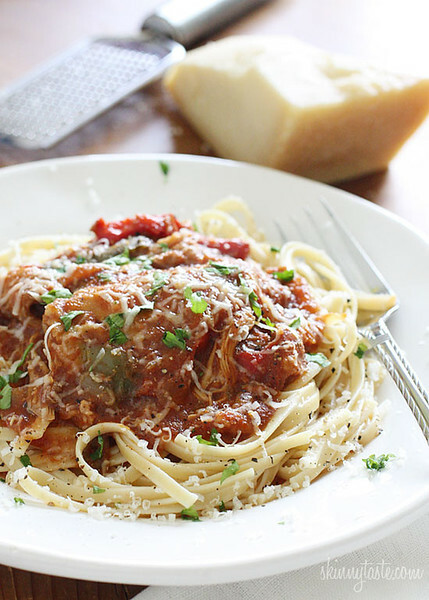 This was simple, easy and flavorful! We served it with rice initially but there was enough leftover that I ended up eating it for lunch a couple days with the Trader Joe's cauliflower gnocchi...which I am obsessed with by the way! Lightly season chicken with salt and pepper and Place in a 5-7 qt slow cooker. Top with onion, bell peppers, tomatoes, garlic, red pepper and broth. A friend of mine has recently started eating a vegan diet and has been sharing all kinds of plant-based recipes. I have been excited to try them out and so far everything I have tried has been really good! When I first made this soup I was SUPER nervous! It made tons, required some work and was bright green and not all that appetizing looking haha! But looks can be deceiving and it was surprisingly good! I portioned out the big batch into smaller containers and have been having it a few times a week for lunch. I love eating soup all the time, but especially in cold weather and to me this is a great replacement for the green smoothies I just can't bring myself to drink when I am already cold. Definitely try this one out! Add broth to a soup pot - saute the onions until translucent and fragrant. Add the garlic, carrots and celery and cook a few more minutes, stirring them around to tenderize. Then add some salt, cauliflower and veggie broth. Bring soup to a boil and cook for another 10-15 minutes. 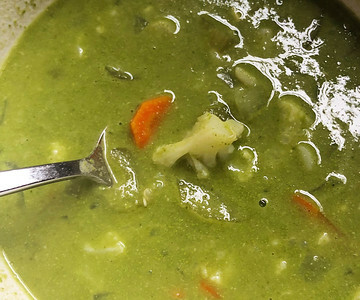 Once the cauliflower is cooked through, add the kale to the soup and let it wilt for a few minutes. Then at this point I like to take the kale and put it in the blender with the soaked cashews, chickpeas and about 2 cups of the broth and blend that puppy smooth. Spaghetti and meatballs is one of my kids' favorite meals and I have used many recipes for meatballs over the years. During the past year none of my older recipes were really doing it for me when I attempted to adjust them to be gluten free so I went searching for something else and found this winner. The meatballs are moist, but stay together, and they pack in lots of flavor considering they are a pretty healthy version. This has been our go-to meatball recipe for quite some time now so I am finally documenting it to make it easier to find! Heat a nonstick skillet over high heat and enough of the olive oil to coat the skillet. Using a medium or large ice cream/cookie scoop*, scoop out the meatballs and drop them directly into the pan. Let them cook for about 30 seconds or until brown, then flip them over using a spoon (I found this was the easiest in order to keep them intact). Cook them until brown on the other side, about 30 seconds, and then transfer to a baking sheet lined with parchment or foil. Repeat with remaining meat – you’ll end up with about 18-20 meatballs using a large scoop, and about 30-35 with a medium scoop. 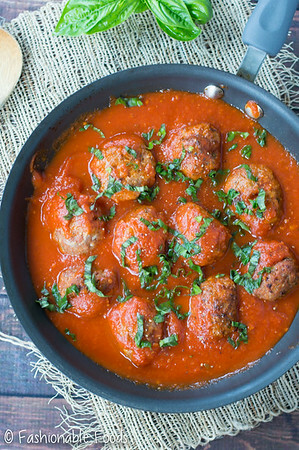 Transfer the meatballs to the oven and bake for about 20 minutes for the large size, or 15 minutes if you used a medium-sized scoop. The meatballs will be firm to the touch when finished. I haven't been posting any of our new favorite recipes because I have been lazy about taking pictures, but then when I want to make them again I am frustrated that I have to search and find them...so I'm just borrowing other people's pictures and getting some posted! First up is this delicious new recipe I found for shredded beef. I adjusted things a bit from one I found on allrecipes.com and I really loved! 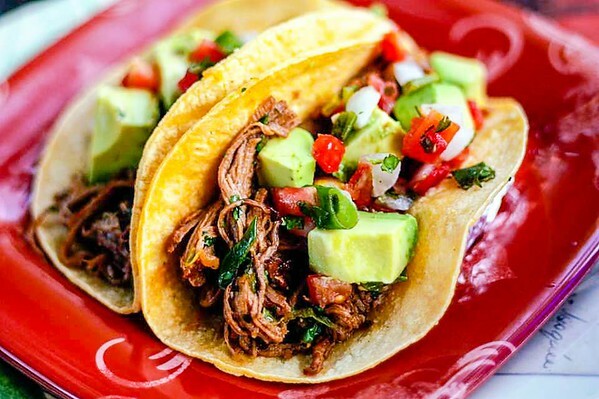 Flavorful and juicy and absolutely heavenly when served in freshly fried corn tortilla shells! Layer half the onion rings into the bottom of a slow cooker. Place chuck roast on top of onions. Pour diced tomatoes, beef broth, and coffee into the cooker over the roast; stir in diced green chiles, jalapeno peppers, garlic, chili powder, cumin, salt, and black pepper. Spread remaining onion rings over the mixture. Cover the cooker and cook on Low until beef is very tender, 6 to 10 hours. Transfer chuck roast to a bowl and shred meat. Return meat to sauce. Remove onions and serve with meat.